It has come to my attention via my friend St Murphy that you are still maintaining your anti-gay marriage stance. We know it is the result of a deal you made with the Australian Christian Lobby to sure up your election chances. But you have broken enough election promises, why steadfastly maintain this one? Seven in 10 Australians are in favor of gay marriage, so please get with the program. Other countries have embraced the concept. And for someone who hails from the Labor Left Faction, you are so behind the eight ball. Heterosexual marriage is not the be-all, some people really screw it up in a grand fashion. Homer and Marg Simpson – we all have to agree Marg could have done a lot better. Kim Kardashian and Mr Blink-And-You-Will-Miss-Me – Fraud or star-crossed lovers? You decide. Only in Hollywood. Princess Stephanie of Monaco circus performers. She enjoyed a romantic liaison with married elephant trainer Franco Knie and moved, along with her three children, into a Swiss caravan to live the circus life. However, that relationship came to an end in 2002, and Stephanie and her family returned to the Monegasgue fold. Then, in September 2003, she wed circus performer Adans Lopez Peres in a private ceremony in Switzerland. Less than a year later, that union also hit rocky waters, with the trapeze artist moving out of the family home. 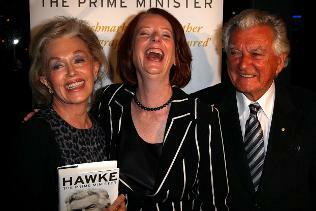 Bob Hawke and Hazel Hawke – Bob left Hazel for Blanche what’s-her-face. The adulterers’ white pants union does nothing for the sanctity of marriage. Wrong! Hazel always deserved better. So Prime Minister, I am sure I have your attention now, especially since I mentioned The Simpsons. It’s time to change your view and get with the majority of the public. Please call me on 1800 WOOG if you would like to discuss any of these issues further. Living with and supporting others with bipolar disorder. Bipolar resources and bipolar advocacy. Are YOU one of the 7 out of 10?